Though I’m guessing all of you were required to read Adam Smith’s Wealth of Nations, most of you will be surprised that Smith, the father of modern capitalism, had a whole lot of advice about how to live a meaningful life, how to treat others and what it really means to pursue happiness successfully. These concepts were fleshed out in a book that very few of my clients have ever heard of: Adam Smith’s The Theory of Moral Sentiments. 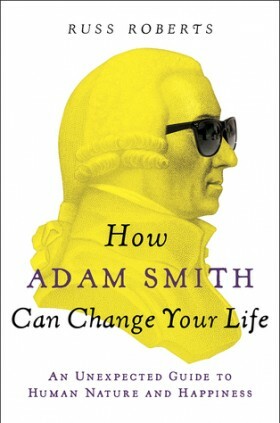 Russ Roberts’ book, How Adam Smith Can Change Your Life: An Unexpected Guide to Human Nature and Happiness, takes an excellent view and boils it down into modern application with examples that are as relevant today as they were in 1759 when Smith’s Theory of Moral Sentiments was first published. You won’t tell my MBA professors if I make the following bold statement will you? No? Good. This book by Roberts and its views on Smith’s theories could quite possibly replace all the texts and all the case studies I’ve reviewed in both of my most recent business ethics courses. Of course a book like this can’t offer the depth of the courses I’ve been through in my MBA program but the overarching themes and principles are spot on. And, they require your thoughtful consideration. “Great,” you say. “One more thing Burleson wants me to read.” Not cover to cover, though, my overwhelmed but serious student… but rather as a reference or guide. This is a book that should be reviewed at least once each year, so you have an idea how you’re doing in the things that really matter. Read it with your spouse or kids and talk about it at the dinner table. Most people blindly chase after “happiness” without ever possessing the most-basic of skills to actually sit down and write out what they want in life. You’ll get really good and knowing what you want in life and have the moral conscience to get it done ethically and productively so that all stakeholders in your life and in your business win. Whether Roberts set out to publish a solid review on Smith’s work or had a deeper purpose in mind, I don’t know. But even my reptilian brain and thick skull can break through the clutter to see the importance of this book. If it stands the test of time and applies in 2016 as much as it did in 1759, you’ve got to at least be curious what it is and how you might benefit from reading it. Such is the case with this book. Of particular interest to the serious orthodontist, read chapters 2, 4, and 8 at least twice.